I live in Snohomish County and have visited Everett a number of times, but I didn’t know that an aircraft carrier, the USS Abraham Lincoln, had its port there — I just learned that during Seafair’s Fleet Week. The warship, which employs more than 5,000 Navy personnel, just returned to Everett last week after several months of training exercises off the coast of Southern California. Public affairs officer Robyn Gerstenslager said it will go on deployment sometime in the fall. 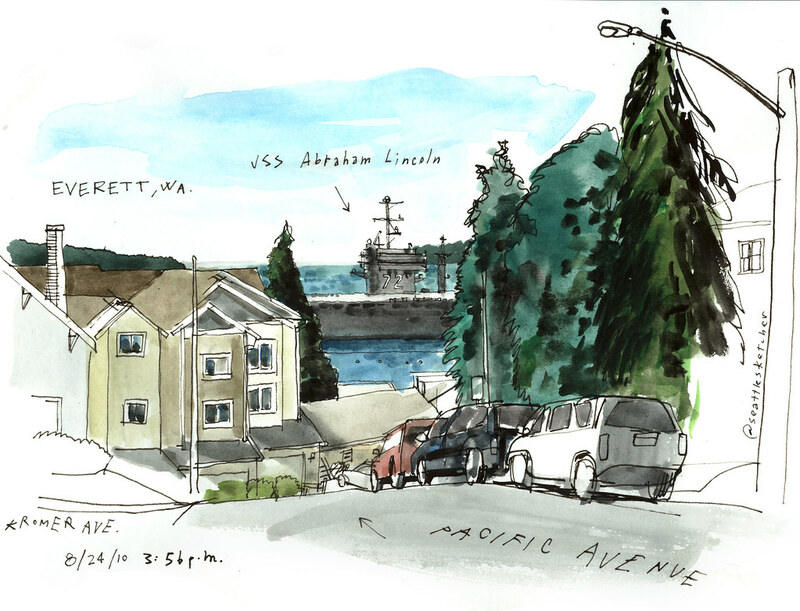 After a visit to the ship this afternoon –stay tuned for more sketches- I drew this view from Pacific Avenue. Everett residents must feel incredibly well protected having this awesome vessel in their backyard. I do too!